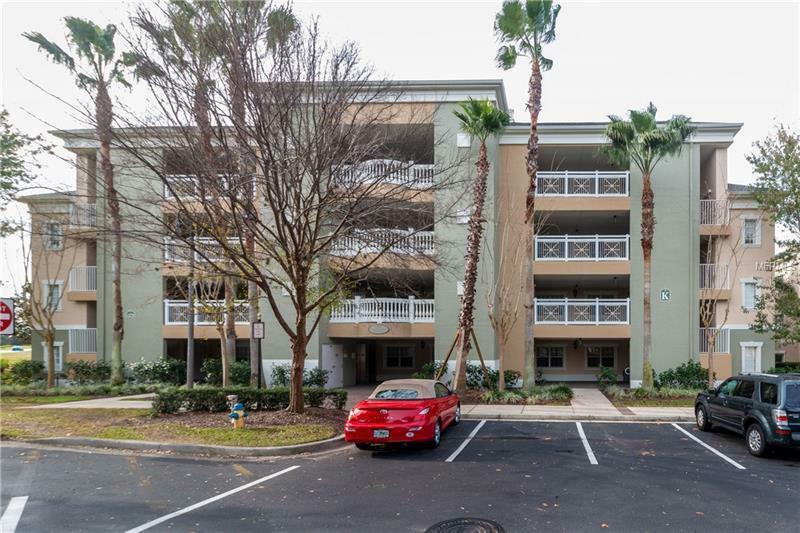 Just Listed Newly Updated Turn Key 3bed/3bath condo. This top floor condo has a spectacular view of Tom Watson's 11th green and the 12th hole and several holes on Arnold Palmers golf course. Large Flat Screen TV and beautiful tile that looks like wide plank hardwood floor was just added. This condo comes with a MEMBERSHIP to the Resort which means access to Member Events, Golf Course Membership, Water Park Access and specials at Spa and Restaurants. One of the Best Locations in The Reunion Resort being centrally located and within an easy walk to The Grande ( a condo hotel) with several outstanding restaurants and The Clubhouse. The tennis club with paddleball courts, playground and pool just steps from your front door. The Resort has 3 World Class golf courses and a golf training facility, tennis club, Spa, 2 fitness centers, 11 community pools, 2 Clubhouses with Pro Shops, three 24 hour manned Guard Gates with onsite security and a Multi million dollar Water Park with a water slide and a lazy river. This beautiful condo is zoned for short term rental, so earn rent when you cannot be here. Reunion is located just minutes from Disney World , Universal and Sea World amusement parks.